Did you ever consider how much water you’d need to haul over to keep that thing alive? Rain fallisn’t going to do it. …I appear to have forgotten to draw Jack’s left arm. Clearly it’s the act of being traded in what looks like a poor-value trade that makes them valuable. 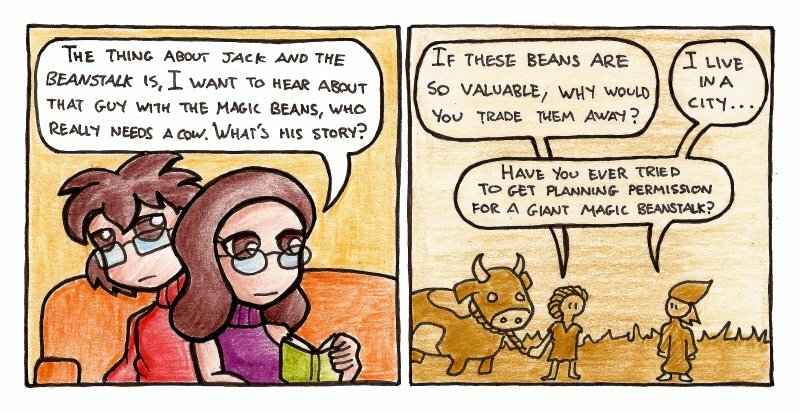 That beanstalk is *worth* a cow and your mom’s displeasure. That’s what it’s constructed of. That’s what powers it. That’s why it’s so tall. And as for why the bean-seller wanted to perform such thaumaturgy, well, that’s between him and the giant’s enemies, I must say, and quite another story entirely. The magic comes from the story? How might we escape this cruel fate?